If you’ve been following Rock Town Hall for even a couple of weeks you probably have an inkling of my severe distaste for the mainstream culture of the 1980s. If you didn’t live through that era and find it “charming” or whatever, I feel slightly worse for the future of humankind. That’s OK, I’m used to feeling that way. What troubles me is how we got to this point considering how great my generation was and how much greater our parents’ and grandparents’ generations were. If we were so great, shouldn’t the youth of today be better? If you lived through that era and look back on it fondly, I am not-so-secretly jealous of you. I had a lot of youthful energy and love to give to the world at that time, and for all my exquisite taste I would have been happy to spread my energy and love on a mutually appreciative world, as you may have been able to do back then. Bravo, ’80s Mainstream Culture Beneficiaries! Many of my associations with the ’80s, then and now, were filtered through my not-always exclusive pursuits of rock ‘n roll and girls, as I was young enough to call them through most of the decade. I desired a mastery of both, yet constantly found myself falling short of the mark. Most of the roadblocks encountered were part of my genetic makeup and/or self-erected. I think of all the poor decisions I made and inflexible stances I took owing to my born and bred stubbornness. I did have good taste, however, and I have no regrets about that. The mainstream culture of the 1980s threw its share of roadblocks at me. 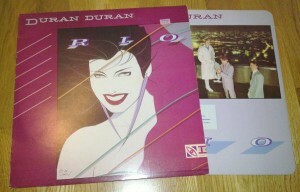 Perhaps no cultural artifact was a more daunting roadblock than a copy of Duran Duran‘s Rio placed at the front of a stack of albums in a girl’s dorm room or apartment. Members of Duran Duran Suggest Awesome Birthday Present Idea for That Special Rock Nerd in Your Life Who’s Turning 50! This clip is courtesy of Townsman cherguevarra, who initially received the link from a friend. What’s the greatest rock nerd gift you’ve ever given or received? Long before Paul McCartney and Wings put out an album of the same name, the idea of a band on the run ties into rock’s rebel spirit as well as the earlier tradition of the bluesman with hellhounds on his trail. Although rock artists often sing of being on the run – from The Man, hellhounds, adoring fans, what have you – they rarely agree to be filmed running. Lately I’ve been scouring YouTube to find videos showing actual rock musicians in the act of running. It’s been tough finding all but a handful of clips that my fading memory could remember from the days when MTV and VH1 actually played music videos. Even that wildly popular OK Go video, although choreographed for treadmill, includes no running. The results are mixed, but I think the results of my survey will satisfy any lingering questions you might have over the marriage of rock music and running. Take your time with this one; we may need all weekend. Let’s start this examination of bands on the run with arguably the greatest of rock running videos. NEXT: Arguably the greatest of rock running videos!